After Seoul, we boarded a high speed train for Busan, a three-hour cross country trip away. I saw the seemingly endless suburbs of Seoul with high rises lined up like dominos three, four, six deep give way to mountains, rice terraces and gardens. 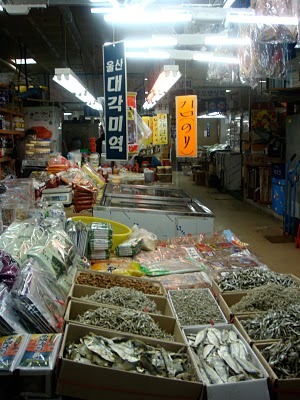 Despite living in a high-tech society, Koreans have a real connection to their food; this is evident not just in the flavors but the freshness and diversity of their produce. 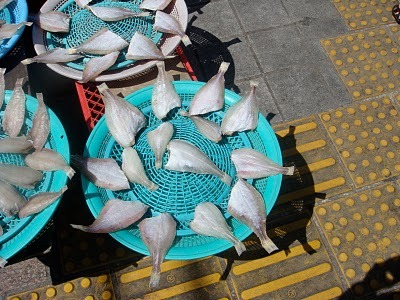 On the boardwalk of Haeundae Beach, there is a raw fish street on one end and a street market village on the other, each selling the freshest catch. That day, after perusing many stalls, I was lured in by a woman in a tiny stall in the Street Market Village with eight fish tanks holding her wares, full of fresh crab, mussels, sea slugs, eels, fish of several varieties and octopus. I selected an octopus, and she promptly cut off the tentacles and served it to me. If you’re squeamish, I certainly don’t suggest this as a meal… the tentacles were still moving on the plate and in my mouth. The whole octopus is served along with mussels and salad and the bragging rights are enough to make the $20 a great deal. I still hadn’t had enough, and so it was off to the Jagalchi Fish Market, South Korea’s largest seafood market. 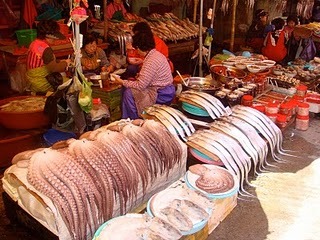 With the freshest fish around, most of it still moving, the market is a place of wonder. Exiting the Jagalchi subway, the smell of the fruits of the ocean is unmistakable. The narrow streets are crowded with people, cars, tour buses and many small stalls displaying and selling all kinds of fish and seafood. Each stall is only about the width of a beach umbrella, and these provide some shade in the water. Food stalls line the streets but the indoor market area has devoted much of its second story to restaurants where they will cook fresh catch, even what you buy yourself downstairs. I recommend eating at Seo Joung Wan, where the food is excellent and good value. For about $40 for two people, you get your fill of hwae (raw fish), typical side dishes and a spicy pot of soup made from the leftovers of the fish used for the earlier “sashimi” course. Traditional korean side dishes such as kimchi are served first, followed by sea slugs, sea squirts and prawns coupled with sushi. It is very filling and wonderful, and huge servings make this all the better. Next, the most tender and tasty grilled fish arrived. It was divine and was followed by a spicy soup made out of the bones of the fish we had just eaten. A cup of hot sweet coffee and a few photos with our host ended the meal, followed by a very long walk around the surrounding area, which is near the site of the Busan Film Festival held annually. An easy subway ride home on the clean and bilingual transport system was interrupted by a quick stop at Shinsegae, the world’s largest department store with an entire entire floor devoted to food. It made for a wonderful last day in Busan. Each day in South Korea was a notable food experience, from discovering mangosteen, a delectable fruit, trying noodle-like jellyfish salad, to discovering how to properly eat traditional Korean BBQ. Then there was the best grilled mackerel I have ever had at a traditional Korean House in Gamjibang, and very spicy dumplings in Seoul on a little back street. When dessert were served at the close of a meal, it often consisted of pieces of fresh fruit, the perfect complement to an endless series of delicious meals. The foods we sampled were all fantastic and prepared to perfection, and the prices were very reasonable and with a bit of effort and cultural awareness, the language was never a serious barrier. I predict Korean food will be the next big food trend in North America. It is healthy, tastes great and has enough exotic flair and complexity to ensure a lifelong journey of discovery. **See Part I for a refresher!